San Francisco businesses must safely dispose of hazardous wastes. Most businesses generate waste that is hazardous to the environment and our health. These include solvents, paints, cleaners, fluorescent lights, aerosol cans, printer ink, batteries, and other items. State law requires that these items be disposed of properly to protect our health and the environment. San Francisco businesses have various options available to safely recycle and dispose of hazardous waste. For additional assistance contact SF Environment at 415.355.3700. Take the hazardous waste to Recology if you qualify. Dispose of small quantities of business hazardous waste (Recology). If you are a business in San Francisco, you may be able to take the hazardous waste you generate to Recology. Businesses that generate less than 220 pounds or 27 gallons of most hazardous wastes each month are eligible to use the City's low-cost hazardous waste disposal program called the Very Small Quantity Generator (VSQG) Program. The VSQG program is available by appointment only. Contact Recology at 415.330.1425. Appointments are generally scheduled on two Wednesdays per month. Make sure you have the name of your business, the type and amount of hazardous waste you will be bringing, and how you will bring it. An identification number issued by the state ("EPA ID number") is required to use the program. Contact Recology at 415.330.1425 for assistance. Disposal fees vary by type and volume of waste. The program is subsidized in order to keep fees low. Learn more about the Very Small Quantity Generator Program (click on VSQG tab). (Recology SF). Find a certified hazardous waste hauler. Find certified local hazardous waste haulers (RecycleWhere). Use RecycleWhere to find certified local hazardous waste haulers providing on-site pick-up or drop-off locations, including resources for pick-up or drop-off of Batteries, Car Batteries, Coolants, Fluorescent Bulbs & Tubes (CFLs), Oils, Latex Paint, Oil based Acrylic or Lead Paint, Printing Ink, Solvents, and other waste. Empty aerosol cans, when both product and propellant have been completely discharged, can be recycled in your blue bin. 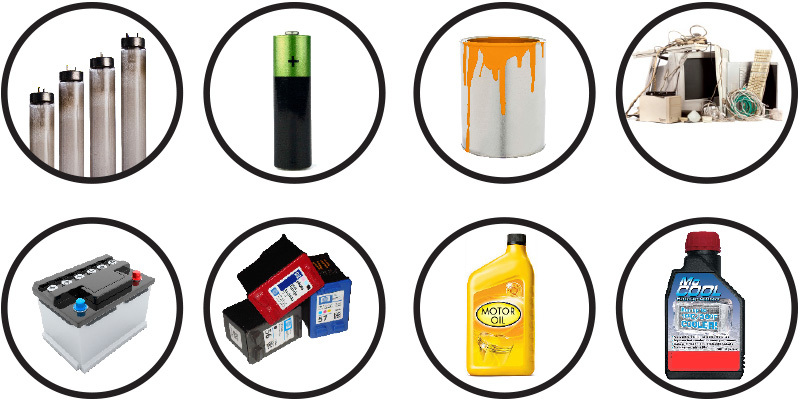 Search on RecycleWhere: Batteries, Car Batteries, Coolants, Fluorescent Bulbs & Tubes (CFLs), Oils, Latex Paint, Printing Ink.